After finally obtaining the right to vote, American women in the 1920s were flexing their liberation in a variety of ways. Some, such as Montana’s Jeannette Rankin, had gone into the halls of Congress. Amelia Earhart proved she could fly airplanes with the best of the boys. Multitudes merely bobbed their hair and became flappers in the speakeasies and blind pigs which sprang up in dark places after the women’s vote helped usher in a quaint Shiite law known as Prohibition. In the West, women rodeoed. Not confined to sissified events such as barrel racing or goat-tying, Montana women such as Alice and Margie Greenough, Fanny Sperry Steele and Marie Gibson were busting broncs head-to-head with their male counterparts. They and trick rider Trixie McCormick were showing their stuff in Madison Square Garden and before the crowned heads of Europe in Wild West shows. Heidi M. Thomas’ grandmother, Olive May “Tootsie” Bailey grew up in the Sweetgrass-Cut Bank area near Montana’s border with Alberta, loved her damned old rodeo and competed alongside the aforementioned legends. She and her husband, Otto Gasser, ranched along the Hi-Line and then in Garfield County. “A petite young woman mounts a 750-pound steer, and hangs on to nothing but a rope tight-wrapped around one hand. That she stays on this bucking, twisting, snorting beast for ten seconds, eight seconds or even two seconds, seems like a miracle. As a girl, Thomas heard of her grandma’s sagas. “She died when I was only 12, so I never got to talk to her about her life as a rodeo cowgirl,” Thomas writes on her extensive website. 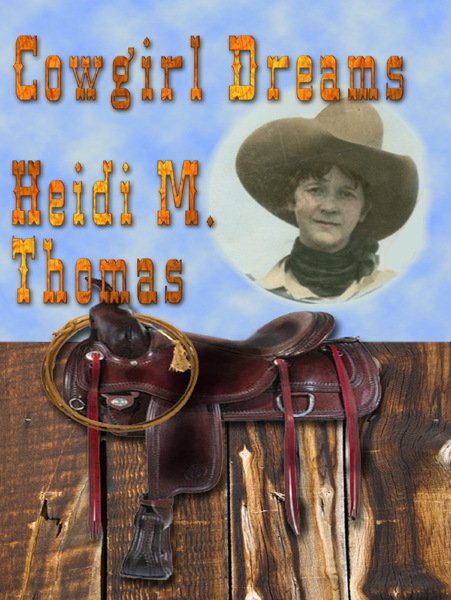 Living in Washington state in 1999, Thomas began setting down “Cowgirl Dreams,” basing the lead character, Nettie Bradley, on her grandmother. Ten years later, she was back in Montana on book tours for the book. She’s back again this year with the story of Nettie’s early married life in “Follow the Dream” and has another title on the next generation, “American Dreams” currently in revision. According to her website, yet another novel, “Rescuing Samantha” is in progress. In the sequel to “Cowgirl Dreams,” Nettie has been married (against parental resistance) to her cowboy, Jake Moser, and they share their dreams of rodeoing together and even raising a family on the circuit, as real-life Marie and Tom Gibson did in the 1920s and 1930s. But into each dream, a little reality must fall and a lot of reality fell upon the Montana landscape in those years. The state’s fledgling homestead agriculture began its death spiral in the 1920s because of a post-World War drop in prices and persistent drought on the highly leveraged land. Banks failed and insect plagues of biblical proportions seemingly descended whenever there was sufficient rain to grow a crop worth destroying. A reverse immigration occurred, as families pooled resources to send one of two members to the coast to earn enough money to buy train fare for remaining family members to escape ravaged Montana. Livestock –- and people – often were left to fend for themselves. 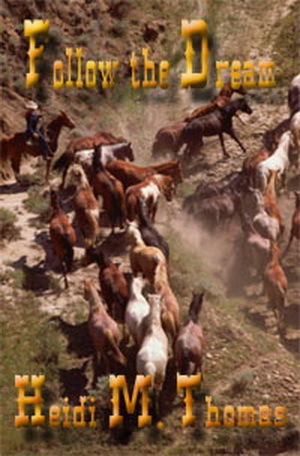 Thus, Nettie and Jake move from ranch to ranch and in 1931, decide to trail their herd of 50 horses two mountain ranges and 350 miles from Sunburst to Salmon, Idaho, where there’s grass. Thomas’ books are classified in the “young adult” category and Treble Heart Books is a Christian publishing house, which in this case means there’s no cussing or violence. Thoroughly vetted, it should interest readers of all ages. I want to take this opportunity to wish all my followers a very Merry Christmas, Happy Holidays and a happy and healthy New Year. I celebrate the birth of Christ and I am thankful for the many blessings I’ve received in my life. 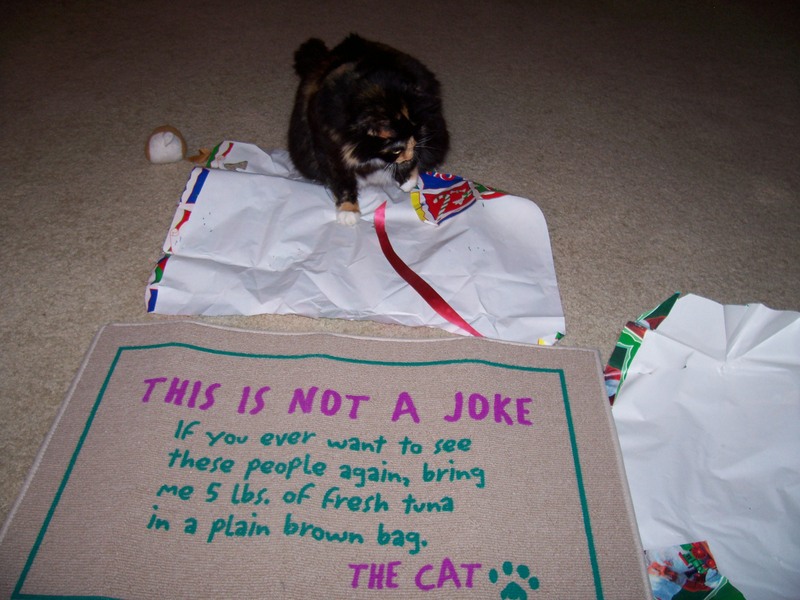 Here are some photos from Christmases, present and past. 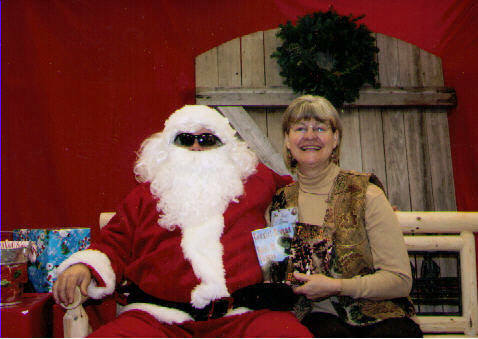 This year I did a book signing at the Country Store Farmer’s Co-op and had to have my picture taken with a “cool” Santa. Every year a group of friends gets together to bake cookies, eat, and exchange our wares. This is a special tradition and special friends. It reminds me of our family tradition on the ranch of making sugar cookies and everyone sitting at the kitchen table to decorate them. 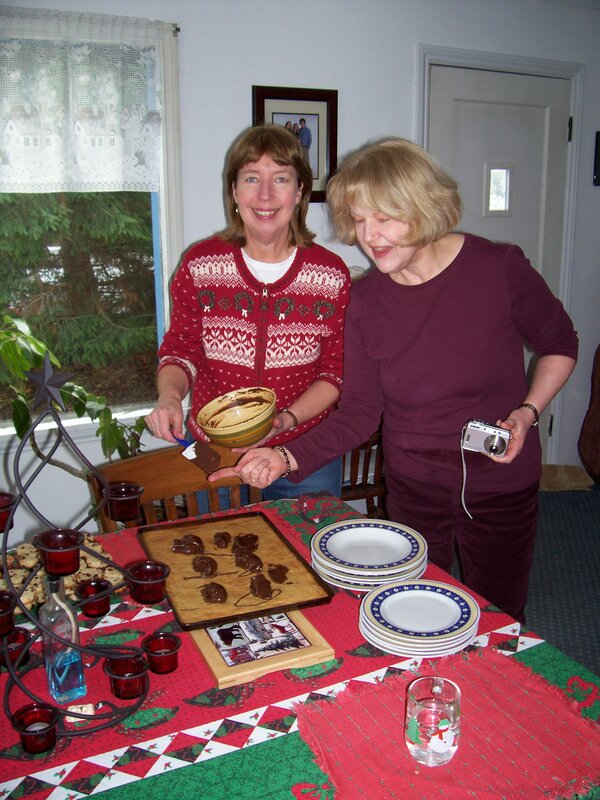 We don’t always have snow in the winter here in the Pacific Northwest, but when we do, I am reminded of Christmases in eastern Montana, being snowed in, playing board games, drinking cocoa and eating Christmas goodies. 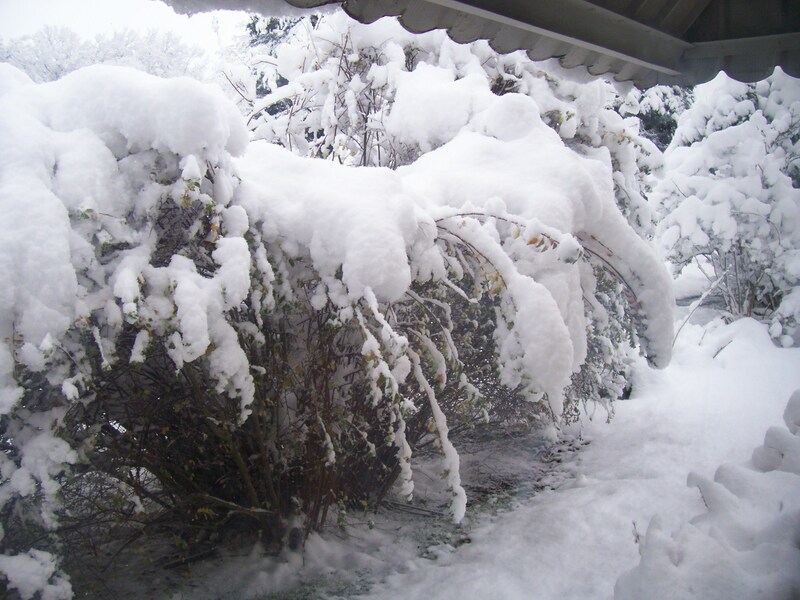 This photo was from winter 2006, when we did have snow for Christmas. Our families are scattered hither and yon, so we don’t often have company for the holidays. 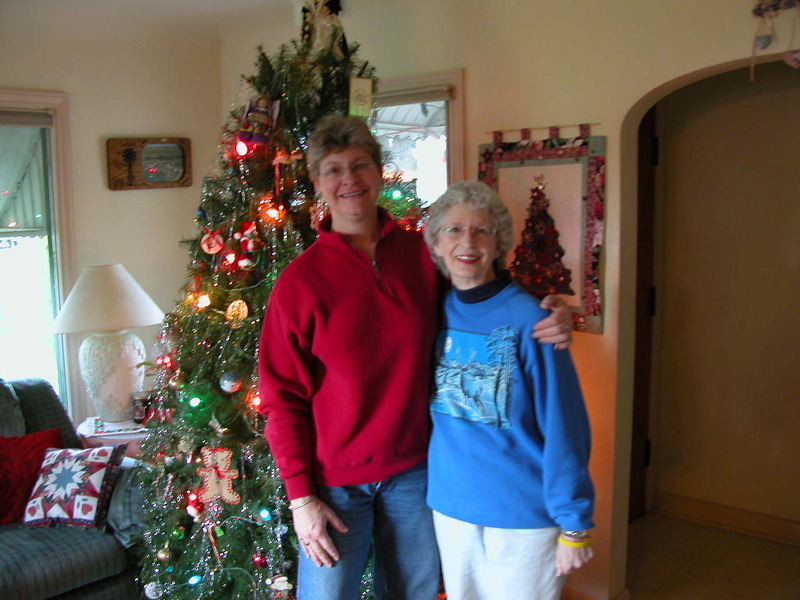 This was from 2005, when Dave’s sister, Marylou, spent Christmas with us. A special holiday! 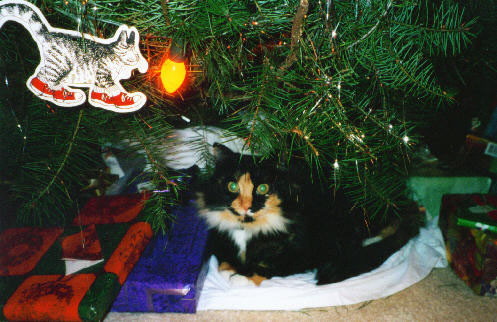 Jellicle Cat (Jelli) likes to nap on the tree skirt under the tree. Probably waiting to drink the milk left out for Santa! One of my all-time favorite gifts! However you celebrate the holiday, my best wishes to you! 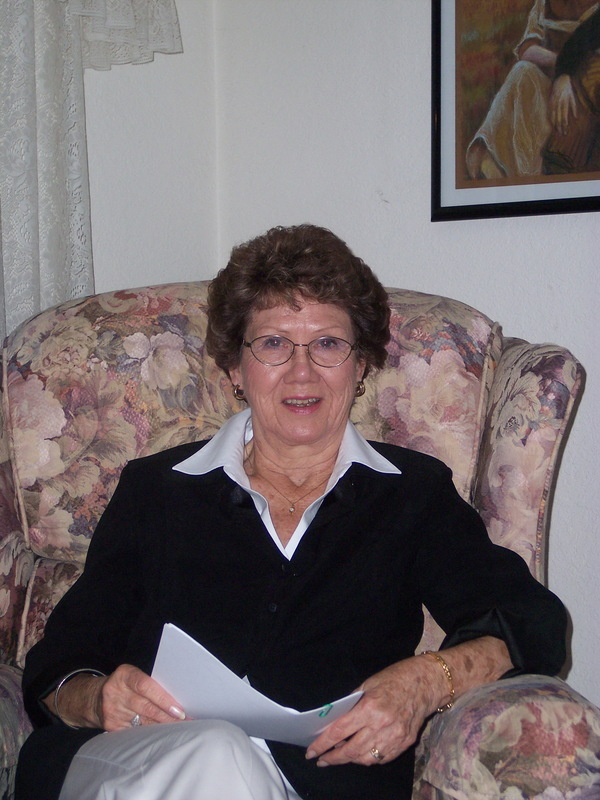 My guest today is Irene Bennett Brown, best known for her historical novels such as The Bargain, The Plainswoman, and Haven. Irene’s latest novel is a departure for her, a cozy mystery, Where Gable Slept. This is an entertaining, fast-paced mystery with a blossoming romance. Celia Landrey leads tours through a historic mansion, where Clark Gable reportedly stayed, to attract tourism to her struggling community. The owner’s death and the shadow of murder threatens to spoil its appeal. Then a mystery woman appears and buys the property out from under the town’s preservation group, with plans to burn it down. 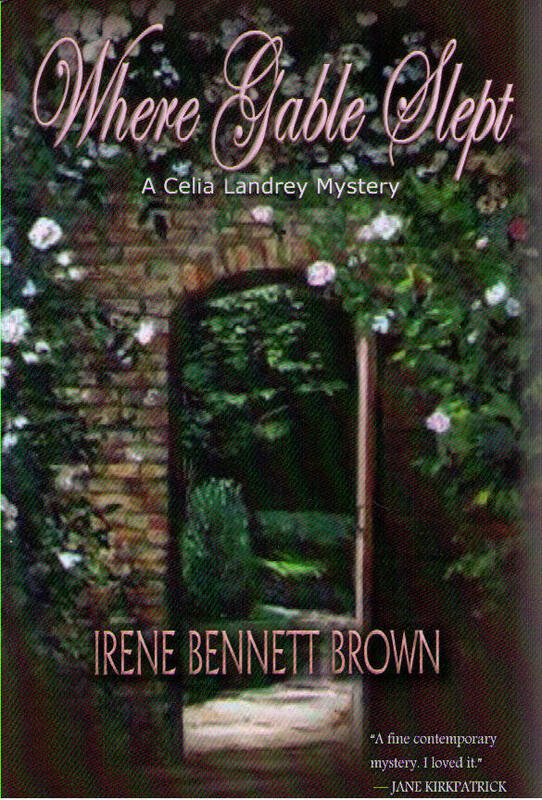 Celia is a well-characterized and sympathetic middle-aged sleuth, and I enjoyed the story very much. Irene, after specializing in historical fiction, what made you decide to write a mystery? As I got older, eyesight problems made intense research difficult for my historical work. I decided to try something light, fun, set in the present day, and for the most part—my own backyard, thus requiring less research. I’d turned to reading cozy mysteries, and after studying several I became excited at the prospect of writing one. Did you find it more difficult to write? Not really, although in the long ago past I was convinced that writing a mystery would be impossible for me–I was sure I didn’t have the intellect/analytical mind a mystery puzzle would require. Maybe years of writing gave me the necessary confidence to at least try. In any event, after I had created a small-town cast of characters I loved and could work with, each with their own personality, motives, and agendas, I had a great time working out “whodunit” and “how come” in Where Gable Slept! Which genre do you prefer? Gosh, hard answer. I love both so maybe no preference? At this time, though, I am more involved in the mystery genre. Are you planning another cozy mystery? Yep. Where Gable Slept begins a planned series. Celia Landrey, walking-tour guide, who one reviewer referred to as “charming and indomitable” will remain as my main character. Plots will also involve other characters the reader met in book one. I’m working now on the second book, with the working title Where Danger Danced. Why did you decide to self-publish this book? Chiefly, I did it myself because I wanted to see the book in print when and how I wanted it to appear. At this stage in my career I have less patience waiting for a traditional publisher to make a decision, which in some cases can be years. Fortunately, I have great help in that my computer-expert husband takes care of the mechanics, formatting and such, to get the book ready for the printer. My daughter is a professional artist and she designed and illustrated the cover of Where Gable Slept. I had the book professionally edited as well. How did you get started with your writing career? I’ve known since I was twelve years old that I wanted to be a writer. 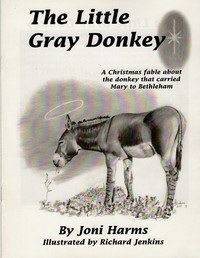 I began very small, writing brief anecdotes and articles for newspapers, then short stories and longer serials for children’s Sunday School papers. That led to writing children’s book-length fiction. I wrote nine books for children and young adults. Many were book club selections and/or were printed in both hardcover and paperback. What were some of your early influences? Easy answer; books like Little Women and Caddie Woodlawn in the children’s field, and adult novels by Frank Slaughter, Janet Holt Giles, Edna Ferber, Robert Penn Warren, Jessamyn West. Countless others, I’ve always been a reader. What was your first published book? To Rainbow Valley is a children’s book and my first. It is a dust-bowl era story about a family who makes a new life in Oregon, much as my own family did. The book was published by David McKay in 1969 and these 40-odd years later, is still available as an easy-reader from an educational publisher, Perfection Learning. How many books have you had published? I have had 15 children’s and adult novels published by a wide range of traditional publishers—Atheneum, Ballantine, Five Star/Cengage to name a few. My two latest, The Bargain, and Where Gable Slept–making it 17–were published by my own imprint, Riveredge Books. Do you have some tips to share with pre-published authors? Read tons in the field in which you want to write. Revise and rewrite until your manuscript is your very best effort. Submit your work and don’t let rejections get you down if this is what you truly want to do. Attend writer’s conferences, learn from the speakers and network with other writers. As author Robert Fontaine said, “To be a writer is to reach, however awkwardly, for the stars, and move however haltingly, in that direction.” In other words, writing is work, no doubt about it. But if a writer is what you’re meant to be, nothing will give you more satisfaction and enjoyment. My guest today is country western singer Joni Harms. I first “met” Joni when my first novel, Cowgirl Dreams, was published. I searched the title and found that Joni had recorded an album, “Cowgirl Dreams,” which has since become one of my favorites to listen to while I’m writing. As Joni says on her website, Country Music was once known as “Country & Western.” It was so called for a reason, of course, since that’s where listeners found songs by such greats as Marty Robbins, Patsy Montana, Tex Ritter and Gene Autry — artists who favored the “western” sounds and values. Somewhere along the way, the “Western” was dropped and, over the past decade, the Country Music Industry has increasingly focused on the more 70s and 80s pop flavored sounds in an effort to attract a younger audience. Harms has been praised for her pure country voice since she signed her first record deal with the famed producer Jimmy Bowen for Capitol in the early 1990s. After that Harms moved to on to her celebrated “Cowgirl Dreams” (1999 / Warner Western). I recently visited with Joni as she traveled the concert circuit. Joni, when did you know you wanted to be a country singer? Who are some of the western musicians who have influenced you? Emmy Lou Harris, Dolly Parton, Merle Haggard and Buck Owens. What was the first song you recorded? And your first album? How has your music evolved since you started? I think/hope my song writing skills have improved and that my story content is more interesting from all of my travels. You’ve done several albums over the years. One of them is “Let’s Put The Western Back In The Country” (Wildcatter Records). Tell us about the philosophy behind this title. I have recorded 10 CDs and I am working on finishing #11 right now. “Let’s Put The Western Back In The Country” was CD #9 but the title still totally sums up what I am trying to do — keep western music available to those of us who still love it and want to hear it! I personally can’t live without Western music. I like a lot of today’s country music, but the truth of the matter is that I’m very serious about keeping the western side of country music alive. Let’s Put Western Back In The Country from Joni Harms on Vimeo. In 2003, Harms was named Female Vocalist of the Year and accepted the award for Song of the Year from the Western Music Association. She is also a multiple winner of Academy of Western Artists Awards, including the top honor of Entertainer of the Year for 2002, and she continues building audiences through appearances on the famed Grand Ole Opry and a recent stint at New York City’s Carnegie Hall. Harms lives in Oregon with her family on a ranch that was homesteaded by her great, great grandfather in 1870. They raise quarter horses and Christmas trees. Her upcoming events include a Christmas show in Slayton, Oregon, a Cowboy Gathering in Monterey, CA, and the Denver Market Show in January.